One of the parameters required for launching an EC2 instance is a Key Pair which is effectively an SSH Key used for interactive logging into the default user account – on Amazon Linux it’s the ec-user account – or for decrypting the Windows Administrator’s password. It is easy to create a new Key Pair / SSH Key as part of the EC2 launch process however as soon as you start using more regions and more accounts you will quickly end up with heaps of stored SSH Keys and unless you are diligent with their naming both on the filesystem an in AWS you’ll end up with a mess. Like I did. Fortunately there is a way to re-use an existing Key Pair in other regions or even other accounts. And it’s actually pretty easy. To import this key to a new region go to Services ➞ EC2 ➞ Key Pairs and click Import Key Pair. Key pair name must be unique within the region (i.e. you can’t have two different keys with the same name) but you should keep it the same between all the regions. Keeping it consistent across regions greatly simplifies your automation – you won’t need a per-region key name mapping. 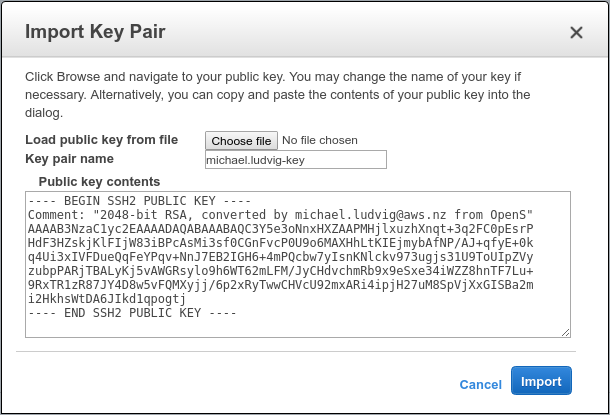 Comment: "2048-bit RSA, converted by michael.ludvig@aws.nz from OpenS"
Using the same command you can also convert your public keys (e.g. ~/.ssh/id_rsa.pub) to this format and import them to Amazon. Now simply copy and paste the output including the BEGIN end END lines and click Import. The key can also be imported from the command line using aws-cli. It’s a two-step process, first save the public key to a file. Note the pub extension, don’t overwrite your pem key! Obviously the KeyFingerprint should be the same as with the GUI import. With a simple for loop over the list of regions it’s easy to import the key into all available regions in a few seconds. Grab the regions.txt file from my GitHub aws-utils project. No clue how I could have figured out AWS is requiring the public key to be in RFC4716 format, I didn’t find any other references.